Two twenty-year-olds are battling each other for the World Champion title of Chess in London. 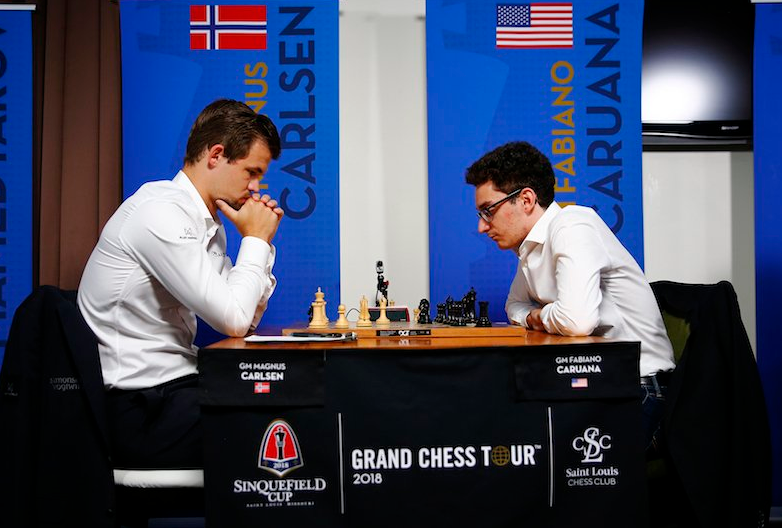 The fourth game of the chess tournament between Norwegian world champion Magnus Carlsen and his American challenger Fabiano Caruana in London ended in another draw. But next to the board a true digital bomb hit, thanks to Youtube. This World Cup chess will never be the same from now on. Tuesday morning a video (of just 2 minutes) of challenger Caruana and his team of sparring partners appeared on YouTube, with images of their preparation for the World Championship match with Carlsen. Caruana could be seen playing some basketball, running around … all very innocent. But then the video suddenly shows images of Caruana and his assistants who bend over possible chess variations for the World Cup. On a laptop images of the openings appear, to which Caruana and his team paid special attention before the matchup against Magnus Carlsen. You see how Caruana wants to defend himself with black in the match if Carlsen would start a match with 1.d4 or 1.e4. And on the screen of Caruana's laptop appear dozens of files with parties from the World Championship match Carlsen-Karjakin (which Carlsen won in 2016). Fortunately for Caruana, the Youtube video was removed from the internet after a quarter of an hour. But on the internet screenshots are still circulating that make for some interesting viewing. Did Magnus Carlsen see the video before he started the fourth game? At the press conference he said with a peeping smile: "Well, I will definitely watch that video now. And then I'll make a decision about that." Once again, the Norwegian added that he "honestly did not see the video in advance, but I know about his existence." On the rest day of the World Cup, rumors in the crowd are buzzing about the incident. A joke or a blunder? Caruana was visibly uncomfortable at the press conference. The American is also known as a correct chess player, so a joke seems unlikely. Psychologically, the video clearly plays in favor of the experienced Carlsen. All of a sudden, Youtube has given the Chess World Cup much more to talk about.